Why is Vitamin A a Natural Antioxidant? Home > Skin Supplements > Why is Vitamin A a Natural Antioxidant? Antioxidants are special substances that help protect cells in the body from damage caused by molecules that are unstable, referred to as free radicals. This damage can lead to cancer and other diseases, and research has shown that certain antioxidants can either slow down or prevent some from occurring, giving us better and more long-lasting health. 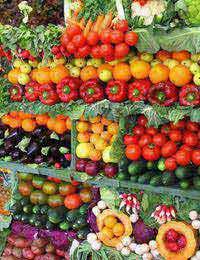 Beta-carotene is a carotenoid, the principle pigment which gives red, yellow, orange and green fruits and veg their colour. It's converted by the body into vitamin A, where it acts as an antioxidant and helps keep us healthy. Other natural antioxidants include lycopene and vitamins C and E.
Most people do not suffer deficiencies of vitamin A except in developing countries, where a lack of this vitamin can cause cataracts and blindness. However, some studies suggest that taking a beta-carotene supplement can also slow done the progression of macular degeneration, an eye disease common in elderly people worldwide. In the West, a healthy diet that is rich in fresh fruits and vegetables usually provides enough antioxidants not to cause an actual deficiency. People who do choose to supplement the amount of beta-carotene in their diet take either liquid vitamin supplements, or supplements in capsule and tablet form. Most take an extra 25 mg per day, although taking more has no serious side effects, with the exception of turning the skin an orangey colour (some may consider this a plus!). Large amounts of beta-carotene can deplete levels of vitamin E, however, so some people choose to take a vitamin E supplement as well. The human body converts beta-carotene into vitamin A, which means there is no set RDA, or Recommended Daily Allowance, of vitamin A. Instead the RDA is expressed as a retinol equivalent, or RE. If you choose to buy supplements, make sure you look on the label to see how much you are getting, which can vary if you are buying a liquid vitamin supplement, a powder or a pill. Only buy vitamin supplements of any kind from a reputable source, and be aware of buying online from countries outside the EU. The products you buy there may not have undergone as much scrutiny for quality and quality as ones you purchase in the UK. To get the most from these fruits and veg it is advised not to peel them, as much of the goodness is in the skin. And while we have been taught that eating raw food is always the best for our health, lightly grilling or steaming some of these vegetables can actually improve our bodies' abilities to absorb them. If you smoke or drink you may need extra vitamin A. That's because alcohol depletes the vitamin A resources in your body, while tobacco stops the body from absorbing the vitamin A already present in your diet. But some studies have said that taking beta-carotene supplements can increase smokers' risk of lung cancer, so it's better to just increase the vitamin A in your diet. Always consult your doctor before taking any supplement, as they can interfere with prescribed medication or with other vitamin or herbal supplement you may be taking. Better safe than sorry!